Pineapple poker is a great refresher for people who have got a bit jaded with Hold’em – just learn these simple rules and you’ll soon be enjoying the fruits of your expertise. There are Crazy Pineapple and even Lazy Pineapple games too, but let’s stick with the core game to start with. You get three cards before the flop instead of two and you must get rid of one of those three before anybody does any betting. You don’t show the discard to anyone. Once this bit of business is done, there’s the pre-flop betting round. The player next to the big blind bets first as they would in Hold’em. 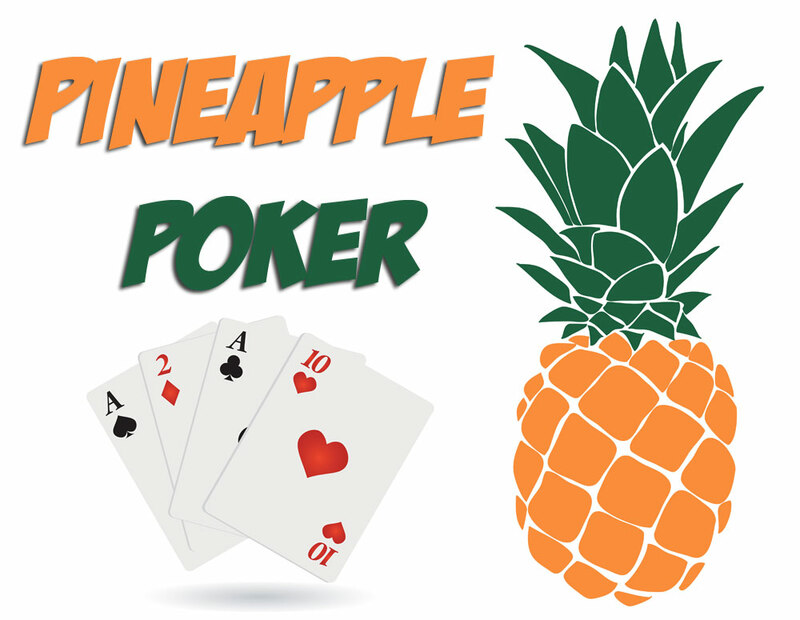 Pineapple poker can be played no limit, pot limit or fixed limit, the same as Hold’em. The key thing to realise is that hands that would see you blasting your way through to the pot in ordinary Hold’em, are less likely to win the pot in Pineapple. The reason is that because everyone is selecting the two best cards out of three, the quality of the winning hands is higher. If you have a high pair, that’s not as strong a hand as it would be in classic Hold’em. So you have to recalibrate and think higher hands, played faster. If there are three of a suit on the table, it’s quite likely that a player has the cards to complete the flush because of the extra card they were dealt initially. So look for higher pairs and cards that are “connected”. This means that there’s some relationship between them – they are the same suit, or the same face value for example. A good starter is an Ace with one of the other two cards having the same suit. With this Hold’em variant, you need to be aware of the consequences of the card you choose to discard. For example, whereas building a flush with table cards is easier, if you start with say, three hearts, and would be looking to build a flush, you have to throw away one of them. So that slightly reduces the probability of building the flush because one of the suit cards is no longer in the game. The effect is even more marked if you get three of a kind. Obviously, since you’ve got to discard one, you can’t get four of a kind. You now have a pair, so if you’re trying for a full house or three of a kind, you need to bear in mind that for the triplet, there’s only one card out there that can complete it. However, the discard also gives you the knowledge that none of the other players has that card or will be getting it. Crazy Pineapple is a kind of madder version of Pineapple poker. It’s not the commonest online casino poker offering but it’s great fun to play and may well become more popular online as more people get to know about it. Basically, instead of discarding one of the three cards dealt at the outset, you keep all three during the betting rounds before and immediately after the flop. Then you get rid of one card, just before the turn is dealt. This produces much higher winning hands, so you have to adjust your expectations of what will actually win the pot. You’ll find pineapple poker online but you may have trouble finding Lazy Pineapple. This variant is called “Lazy” because you don’t have to go to all the stress and bother of deciding which card to discard until all the cards have been dealt out. You keep all three of your initial hole cards until after the River is dealt, and the final round of betting is finished. Like Crazy Pineapple on steroids, the hands get higher because players are effectively selecting five cards out of eight, rather than five cards out of seven. This completely alters the odds, so best to forget everything you think you know about Hold’em poker strategy before embarking on a game of Lazy Pineapple. Deadly serious Hold’em players are unlikely to want to switch to Pineapple Poker or its variants but for many people, it’s a refreshing change.